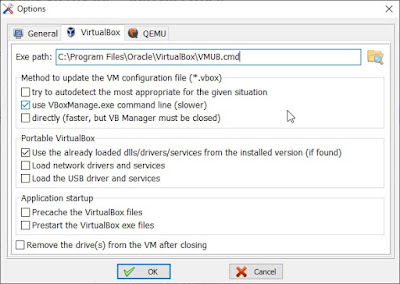 The new version 6 of Oracle VirtualBox has changed executables and so it has (deliberately!) broken backwards compatibility with all earlier scripts, shortcuts and applications which call VirtualBox. I recommend changing the executable path to VirtualBoxVM.exe. However the 'Manage' button in VMUB will not work. 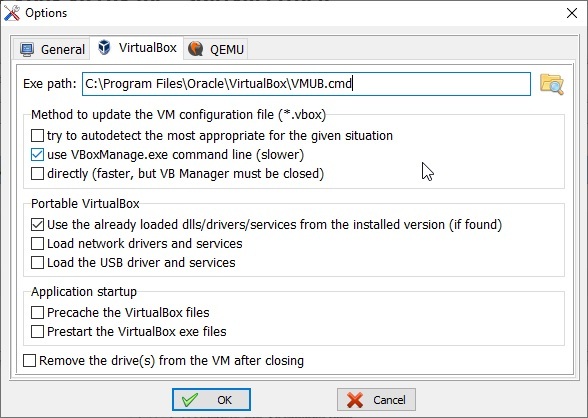 If you want to run Virtual Box Manager then set up an Administrator Desktop shortcut if you want to run the Manager. The fix below does NOT lock the USB drive and can cause boot failures. 2. Run an Admin cmd shell (use WinKey+X - Powershell (as Admin) - and then type cmd to get a cmd shell). Note: This fix does not work correctly because the .cmd file causes the USB drive to be re-mounted by Windows. This means that booting to WinPE, etc. from VMUB may not work.